This is another chapter in the ongoing saga of heritage building and heritage character protection on Auckland's waterfront. It concerns what is happening - or is in danger of happening - at Wynyard Quarter as relentless development pressure is brought to bear on the fragile heritage receiving environment that is being progressively developed. While I was on Auckland Regional Council I worked hard with Councillor Sandra Coney in particular to get sufficient protections built into the relevant planning documents. This 2009 blog gives the background to an important change that was made by Auckland Regional Council to the Urban Design Framework for Wynyard Quarter. Up to that point in time the Framework did not include as a principle, any mention of maritime heritage. Heritage experts were then retained to advise on the key buildings and features of Wynyard Quarter. Their work is illustrated in this map, which you can click on to see the full size. The outlined buildings are those identified by the heritage advisers, while the dotted lines indicate the adjacent land that is important in terms of actually looking at the buildings and appreciating them. The tanks that are outlined are those that were on Wynyard Quarter before 1940, and were regarded as heritage value because of that. This includes the cement silos. The arrows are important. These indicate the significant vistas or views of the heritage buildings and character sites. It makes sense to have these indications - because there's no point in having heritage and looking after it if you can't actually see it. With this expert work done, both the Auckland Regional Council and Auckland City Council were ready to notify the relevant changes to the District Plan and the Regional Plan Coastal. These changes included schedules identifying the heritage buildings that Council had agreed should be protected. Immediately these schedules were criticised by land owners, many of whom wanted to demolish the buildings, create brown field sites and redevelop from scratch. During the Plan Change process the number of protected buildings was knocked back to 9, but Auckland Regional Council fought back indicating that heritage character was important not just narrowly defined heritage buildings. Many of these objections went before the Environment Court while I was still on Council. I recorded my concerns about these attacks, site by site, and building by building in this blog. After the appeal, and after consideration by New Zealand's leading heritage judge this number was reduced by a further 3 this effectively destroyed a strong character precinct in Beauchamp Street between Fanshawe and Pakenham. This map sets out the Judge's decision. But that's not all. In the plan that was finally notified, a number of laneways and new view shafts were identified – some of these went directly through identified character buildings. You see? In the beginning the heritage and character buildings were a big part of the view. 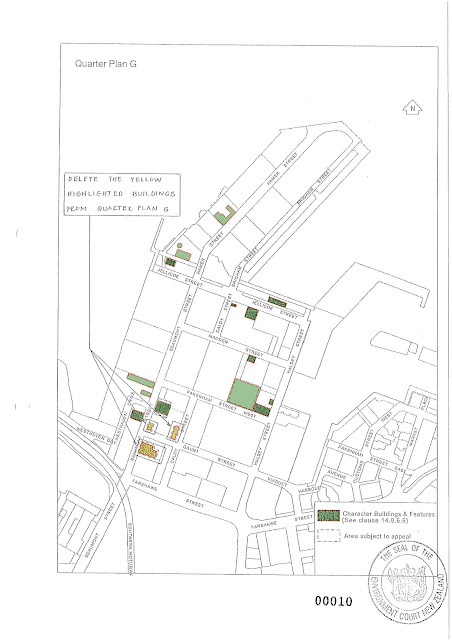 Council went ahead to give effect to its 2009 decision: "that maritime heritage and waterfront character need to be protected and enhanced to the maximum extent possible, alongside other principles in the Urban Design Framework...."
This map - a more recent modification - shows these new view shafts, and the heritage buildings that are deemed "in the way" of these views. One view appears to be toward the city, the other appears to be toward the Harbour Bridge. Ironic indeed that the newspaper reports of the Waterfront Conference and presentations being held now in Auckland - from Hamburg and such places - highlight the emphasis these exemplary waterfront developments accord maritime heritage. Even more ironic that the views of modernist Auckland architecture are now being regarded as more important than views and buildings that have been identified by experts as being of significant heritage value. In the Mayor's message to Auckland in the Draft Long Term Plan 2012-2022 out for consultation now we read the following: "...properties of equal value will be paying equal rates, wherever you are in the region. Properties in Takapuna will be rated at the same level as those in Titirangi and those in Takanini..."
This drastic simplification is one solution available to the Council in compliance with the law requiring it to produce one rating system for the region. The same "one size fits all" approach is being applied to dog licences, rubbish collection, and I dare say to a whole heap of council services which have been applied in different ways and with different priorities across Auckland by the previous different City Councils. There are lots of nice-sounding words used to describe this process. Like "harmonisation". But is this gross simplification of Auckland's rating system justified? Especially in light of the fact that the impact of the Auckland council's rating proposals will be a massive increase in rates for those in properties of above average capital value, matched by a corresponding decrease in rates for those living in properties of lower than average value. The Local Government Act calls for a Funding Impact Statement. In fact it's a requirement. I couldn't find one in Auckland Council's draft long term plan. To give you an idea of what one of these looks like check this one from Tasman District Council. You will see that the Council has assessed the level of service that different parts of the district receive, and this has been translated in a "cents in the dollar" rating value, by service type. In other words your rates contribute toward the cost of the services that you get. Auckland suburbs are not the same. So why should they pay the same rates for the same house value? Over the years the costs of living (including rates), and the priorities for Council expenditure (parks, clean beaches, free swimming pools etc) - have influenced the decisions of people in where they choose to live. That is called choice and is fundamental to the development of diverse communities within the city conurbation that is Auckland. These communities have developed over more than a hundred years - some of them. Other communities are more recent. But they are not the same. Nor have they had the same services. Nor has their development been subject to the same planning rules. In its time the Auckland Regional Council recognised that different communities benefited from different levels of public transport service. For example some communities were close to rail services, high frequency bus services, or the Northern Busway. And houses of the same value paid different rates as a consequence. This is rational and fair. It is also transparent. Ratepayers can examine the Funding Impact Statement and understand what services they are paying for with their rates, and they can also understand why they might pay more rates - for example - for sewer infrastructure (because of the amenity of local beaches), for public transport, for rubbish collection using pay-by-bag (instead of bins). And so on. Auckland Council's harmonisation is more like Stalinisation. This might suit Council's bureaucracy and internal systems, but surely Auckland is entitled to a little more sophistication and diversity in service delivery and rating from its new Council. And surely Council can find room for fairness in its rates. Just because someone is living in a home with more than average Capital Value, does not automatically mean they have the ability to pay significantly more than average rates. I know that Councils generally take the view that home value is a rough proxy of the ability to pay. But many pensioners and pensioner couples on fixed incomes who have lived in modest sized family homes and had families should not then find themselves suddenly rated out of their homes because the Council has not properly thought through the consequences of its blunt proposals - particularly a UAGC set at $350. 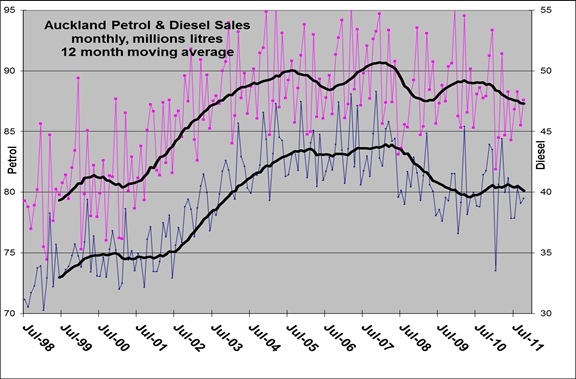 A friend sent this analysis of Auckland's petrol and diesel sales over the past 12 years or so. I'd particularly like to see the data for the last 9 months. Wouldn't you? He sees the information as "...an economic proxy for the region, as well as an interpretation of the aggregate traffic activity..."
The data indicates that present consumption is back where it was 8 years ago. That indicates a big reversal of GDP growth - though it could just as easily indicate that people are using fuel more efficiently, or that they are cutting back on unnecessary car trips. If that was the case it would be a good thing - even if it shows up as a dip in Auckland's regional GDP. It's about time we began prominently using other indicators that show increases in productive efficiency, and increases in efficient use of resources (land or fuel). The Auckland Plan's simple emphasis on GDP growth as a measure of the success of the Auckland Plan (or not) is buying into the old paradigm that any growth is good growth - even if it means increasing consumption of fuels that we all know are finite in capacity, and increasingly expensive to buy. Despite setting a significant increase in passenger transport targets, the Auckland Plan strongly emphasises investment in roading infrastructure for cars. Central Government has made no secret of its support for these initiatives, and has Auckland Council's arm up its back by with-holding financial support for major public transport projects backed by Council and the wider Auckland community. The Auckland Plan could be described as a balance. But that would be charitable. I understand that the finished Auckland Plan looks very beautiful. No expense spared. But then most development prospectus documents look and feel like that. Glossy. Thick paper. The very best photographs. Endlessly edited. Give confidence to investors. Let the market deliver growth and prosperity to all of Auckland. We've tried that. It doesn't work for large parts of the Auckland population who live in crowded houses, have to drive long distances to work, shop, go to school, whose energy costs are increasing ahead of inflation, and whose children and parents have few options to own their own homes in the neighbourhood. The market is not interested in developing the self-sufficient communities that are central to delivering a compact and efficient city. Supporters of the Auckland Plan argue that the old urban limits and plans to contain 75% of new population within existing boundaries "are not achievable", and that even maintaining population growth within the relaxed target of 60% (plus I hasten to add some 1400 hectares of new greenfield land for business), "might not be achievable". Of course it won't be achievable. Especially if Auckland Council does not take its planning responsibilities seriously, and if it leaves these sorts of planning outcomes to the development market. You only have to look at the latest piece of Auckland greenfield development that is happening at Hobsonville, North West Auckland to see what happens when the market takes over. The original vision for this inner harbour community was of a mixed development with employment, village centre, and an integrated mix of state housing and high quality private development. That was the plan the Auckland Regional Council was presented with when I was on that Council, and when we had the job of signing off the relevant District Plans. I was one of those arguing that development needed to be staged to ensure the mixed vision was in fact steadily implemented on the ground. With triggers before the next stage could proceed. Man oh man did Waitakere City Council and assorted developers kick back against that idea. Trust us they said. Don't constrain the market. What has happened? First up Central Government walked away from funding any State Housing there. Next up Super City had the job of finalising various appeals outstanding. No such thing as Chinese Walls now. The self-sufficient community vision for Hobsonville has now been reduced to an expensive coastal development with big box shopping - like you see at Westgate and Albany Mega Centre. These are not communities. These are development opportunities. These are the future communities that will be permitted under the Auckland Plan. This is a great picture of Shed 10 on Queens Wharf. Despite agreeing to a review of the Port Expansion plans, Mayor Len Brown remains committed to a long term primary cruise ship terminal development on Queens Wharf incorporating Shed 10 into his plans. He seems unconcerned that this is now a Historic Place. Queens Wharf is a Category 1 Historic Place now. This includes Queens Wharf as well as Shed 10. This place was registered as a historic place by the Auckland Historic Places Trust (HPT) on 10-Dec-2010. Just because it's a historic place does not mean Shed 10 can't be adaptively reused for an appropriate purpose. That's true. But already I see ugly and damaging changes to the wharf and to the setting of Shed 10, as Len Brown's vision becomes more and more concrete. Unsightly fences are already there. If they are any indication of Len Brown's heritage sensitivity, I shudder to think about what's coming. You might be thinking, "Joel, let it go. You've got a Port Expansion plan review. That's enough...."
Wrong. Auckland was promised an integrated waterfront plan. The key word there is "integrated". Auckland will suffer from a disintegrated waterfront plan. It is no good if we have a review of the Port plans - that gets done next year - and while we wait Queens Wharf gets taken over by cruise ships for ever. That is the risk. That is what Len Brown seems to be set on. That is why people like me wanted and expected an integrated waterfront masterplan - one which integrated the needs of cruise ships and container ships and considered how this heavy traffic could be dealt with by the port - leaving Queens Wharf as a historic place untroubled and undamaged by long term intervention. Queens Wharf was constructed in 1907-13 as the centrepiece of a redevelopment by the Auckland Harbour Board (AHB) to improve Auckland's port facilities. At the forefront of innovative technology, it was among the earliest concrete wharves in New Zealand and contributed strongly to the development of Auckland's economy. Designed primarily for loading and unloading large overseas vessels, the wharf has also been an important place of embarkation and arrival for passengers and is associated with significant events in New Zealand's history including the 1913 Watersider's strike, the influenza pandemic of 1918 and the country's involvement in two World Wars. It is now the best-preserved of the early twentieth-century finger wharves along the Auckland waterfront, visibly retaining structures and features - including a notable double-storey shed - linked with its early use. The wharf was erected in Commercial Bay, which was used by Maori for food gathering and other purposes before European arrival. Following the foundation of colonial Auckland in 1840, reclamation of the bay successively occurred. By the early 1860s, a large timber wharf had been erected to service the town's growing commercial centre. A timber wharf survived until the early 1900s, when the inadequate nature of Auckland's harbour facilities caused the AHB to instigate improvements. In 1903, the AHB employed W.H. Hamer, who was previously Resident Engineer at the Royal Albert Docks in London. 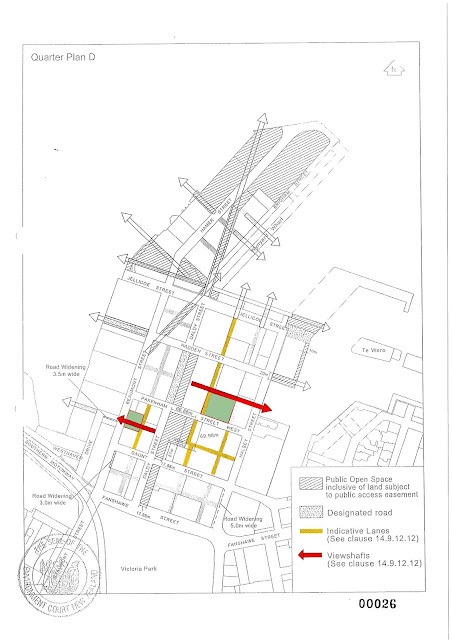 Hamer produced a plan for the comprehensive improvement of Auckland's waterfront incorporating a series of finger wharves. The Ferro-Concrete Company of Australasia, was contracted to erect the first of these in reinforced concrete at the Railway (later Kings) Wharf, and by early 1907 had begun building the new Queens Wharf. The company is reported to have been the first to use the Hennebique method of concrete construction in New Zealand, and simultaneously constructed Auckland's Grafton Bridge (1907-10) which had the world's largest single reinforced concrete span when built. From 1909 work at Queens Wharf was carried out by the AHB evidently under Hamer's supervision, and was completed in 1913. Hamer's design for the wharf encompassed a central roadway; flanking sheds for the storage of cargo; and railway lines on the opposite side of the sheds beside each quayside. The tracks were connected to the North Island Main Trunk Line via the Auckland Goods Station, enabling direct access between the wharf and Auckland's extensive rural hinterland. Cargo sheds were of steel-frame construction with corrugated iron cladding, and were initially envisaged to all be double-storey to accommodate transit facilities on the ground floor and warehousing upstairs. The first of these (Shed 'G', later known as Shed 15, then Shed 10) was erected on the east side of the wharf in 1910. Single-storey steel-framed structures were built on the west side, including Shed 'J' (later known as Shed 18, then Shed 11) in 1914. A Police and Customs Building was constructed near the south end of the wharf in 1911-12. Before the wharf was fully finished it was used for berthing the HMS New Zealand - a gift from the New Zealand government to the Royal Navy - which was visited by some 94,000 Aucklanders. Towards the end of 1913, the wharf was occupied and barricaded by special constables during the Waterfront strike. The opening of the Panama Canal in 1914 resulted in Auckland becoming the first point of call in New Zealand for ships from Europe and the eastern USA, leading to a further growth in activity. By 1920, Auckland had become the busiest port in New Zealand. Throughout this period and during the following decades, the wharf remained a central part of the waterfront, housing the Wharf Police and Customs Offices, as well as providing regular ferry services to the North Shore from berths in its southwest corner. It was a venue for ceremonial events, including the departure of troops for the First World War (1914-18), and British royal visits. In 1918, it was linked with controversy over the introduction of the influenza pandemic to New Zealand, which ultimately claimed over 8,000 lives and has been regarded as the country's worst public health disaster. Many believed that the RMS Niagara was responsible for introducing the virus after it discharged passengers at Queens Wharf without quarantine, although this is no longer considered to be the case. During the Second World War (1939-45) the wharf operated at full capacity to assist the allied war effort, and was part of the infrastructure that supported the military campaign in the Pacific. At this time, the port was considered to be of 'vital national importance.' Facilities were later affected by the 1951 Waterfront Workers Strike, one of New Zealand's longest and most costly industrial disputes. Some changes to the wharf occurred in 1951, but it was with the advent of containerised transport that the biggest alterations occurred. The former Police and Customs building was demolished. Some of the sheds were destroyed or removed. In 2004, a new ferry terminal was built in the southwest part of the wharf, incorporating an early ferry shelter. 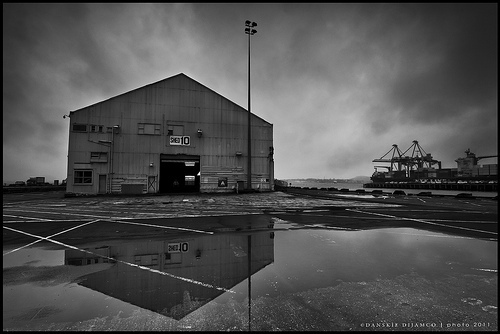 In 2009, the main part of the wharf was purchased by the government and the Auckland Regional Council. Following a public debate about the fate of two remaining sheds, one (Shed 'J', or Shed 11) was dismantled and removed in November 2010, and the other (Shed 'G', or Shed 10) retained for ongoing use. I am not alone in regretting that one of the legacies left Auckland by the Rugby World Cup is Murray McCully's Cloud. The construction and planning of this was rushed through under the Rugby World Cup Empowering Act. Resource Management Act (RMA) niceties were ignored because of Party Central demands. Fair enough I guess - we needed to have that party and do it well. But now it sits there. Empty - apart from events at the end with the view. But these could be provided for without the rest of the cloud. Wynyard Quarter is praised by contrast. The good planning that led to these outcomes was under the RMA and included a set of Plan Changes and a suite of resource consent applications. Due process for Queens Wharf under Len Brown's regime appears to be a process which subverts or avoids the RMA. No public process. No notified resource consent applications. Ask the best urban designers and architects to shoehorn something into Shed 10 that doesn't trigger the need for a resource consent. Let's see what we can get away with down there - at the edge of the law - get the best legal advice - because Len must have his cruise ship terminal. What is it about Cruise Ship terminals? A few wines at Cunard's table seems to be all that is needed. Come on Len. Be fair. Due process and all that. Do something temporary on Queens Wharf. You wouldn't want to pre-empt the findings of your Port Plans review would you. Rumour has it that various players in Ports of Auckland and Council's Investment entity expect to be given the job of reviewing their own plans after Auckland Council's decision this week that Port of Auckland's Expansion Plans should be reviewed. Like many others I welcome this decision as an appropriate spanner in the works. I imagine that many in Council see it more as a kick for touch, and merely a mid-course adjustment. That is why it is important that the Terms of Reference for the review, as well decisions about the Political Steering Group for the review, and the decision about what organisation actually writes the review are themselves made properly. These words were supported by comments to the effect that Ports of Auckland need to form "partnerships" with other entities like Ports of Tauranga or Northport. However that really is wishful thinking. As Cllr Mike Lee noted in his comments at the meeting, such relationships which might be construed as collusion, are essentially against the law in New Zealand whose legislative environment pits Port against Port, and requires individual Ports to invest heavily and offer discount deals to attract container custom from shipping companies. Needless to say, Auckland is not the first city to review its port expansion plans. For example Dublin reviewed its port plans in 2007.
iii. Port activities continuing at current levels with growth being catered for at alternative location(s). In relation to ports policy, the Department of Transport’s Statement of Strategy 2008-2010 summarises the key tenets of ports policy which is “to ensure investment in ports meets port capacity requirements and to facilitate the availability of commercial port services which are effective, competitive and cost efficient”. The National Development Plan emphasises that the State-owned commercial port companies should fund their operations and infrastructural requirements without recourse to the Exchequer, either from their own resources or by other avenues such as efficiencies, increased charges, disposal of non-core assets, borrowing or private sector investment. The present ports policy is essentially market led and does not attempt to implement an interventionist planned approach. I won't spoil your fun by telling you what was advised because these stories never have quick and tidy endings. ...undertake a review of the impact of port planning on competition in the provision of container stevedoring and related services in Victorian ports. This follows from the Commonwealth of Australian Governments entering into the Competition and Infrastructure Reform Agreement (CIRA), which, among other things, requires each jurisdiction to undertake a review of port competition and regulation. • the Port of Melbourne and, in relation to potential new container service providers, the Port of Hastings. • container stevedoring, container handling and storage, container transport (road and rail) and intermodal services. • assess whether the market structure for stevedoring services impacts on competition and the efficiency of container handling, storage, transport and intermodal services, and how the market structure for container stevedoring and related services impacts on: the achievement of the Government’s objectives, particularly the target for rail to have a 30% share of port freight; land-side interface efficiency; and achievement of the Government’s other relevant objectives. This was a Government triggered review. You can see its emphasis on the theory of competition. It asks questions about how easy it is for a "new entrant" to come into the industry and establish a competing service. You can see that it was also essentially about "stevedoring" which is the loading and unloading of cargo. It appears that at the port of Melbourne there are two major operators: Patrick (Asciano) and DP World, presumably competing with each other. There is only one operator in Auckland's Port. There is no competition there. You can think of stevedoring as just the act of putting a container on a ship, and taking it off, or you can go wider and think in a broader freight logistics sense - and consider freight movement end to end. This broader sort of thinking is what is needed in Auckland's review. A whole of North Island look - rather than the sort of narrow Ports of Auckland look that could be expected if POAL or its owner - Council Investments Ltd - did the review. It's the big picture review that Auckland needs. Not some head of the pin analysis of wharf side stevedoring. Those to be consulting for the review include: All Port Authorities; Ports WA; Department of State Development; Department of Treasury and Finance; Department of Premier and Cabinet; Minister of Transport; and Key industry representatives and stakeholders (which include: Port User Groups; Councils at port sites; Dept Environment & Conservation). This sort of review would look at the fundamentals. Central Governmment must be aware that port competition is not delivering economic efficiencies. What we are witnessing is market failure on a grand scale. Arguably port infrastructure in New Zealand is as important as road infrastructure. But because we are a small country, with small ports, each port has only one operator, and in reality there is no competition for wharfside stevedoring. Port competition in New Zealand is an ideological construct, it's a myth, that is why we need a fundamental review, with the Ministry of Transport at the table. Last week was a big week for Auckland's waterfront. And I'm not talking about the strike. Thanks to a huge amount of work from Heart of the City (Alex Swney and Greg McKeown), the Auckland Architects Association (Adam Mercer), and the Devonport Borough Council (Roger Brittenden and Margot McCrae), and many others behind the scenes, the Auckland Council agreed to review the plans it included in its draft Auckland Plan (the Spatial Plan). The New Zealand Herald also played its part in bringing about this decision, as is evident from the way it reported Council's change of plan. I fear that Mayor Brown’s faith in Resource Management Act processes to deal with matters of public interest on Auckland’s waterfront raises questions about his Council’s commitment to planning compliance, and about what proper processes are. Legislation establishing the Auckland Council required it to prepare and adopt a spatial plan to provide a long term strategy for Auckland. This is a different approach to planning. The spatial plan’s objectives have to refer to the social, economic, environmental and economic realms to align it with the four well-beings referred to in the Local Government Act 2002, and to broaden the purpose of the spatial plan so that it is not simply about growth and development. Auckland Council has prepared a draft spatial plan which is out for consultation now. Public concern has arisen because Council’s spatial plan documents all incorporate – without question or serious consideration of alternative options - Port expansion plans which assume a 400% growth in container volumes and 18 hectares further development of Waitemata Harbour through reclamation. Mayor Brown is an optimist, and that’s a good thing, but he’s dreaming if he believes that a Waitemata Harbour resource consent process is the right place to resolve the policy conflicts that inevitably exist between this proliferation of organisations, let alone with public interest considerations. The spatial plan is intended to set a strategic direction for Auckland and its communities that ‘integrates social, economic, environmental, and cultural objectives’. It is about integrated planning. It is not about a proliferation of separate plans - one for the Port, one for the rest of the waterfront, and one for the downtown city. That’s what Auckland had before amalgamation. And if 20 hectares of new reclamation is not ‘critical infrastructure’ I don’t know what is. 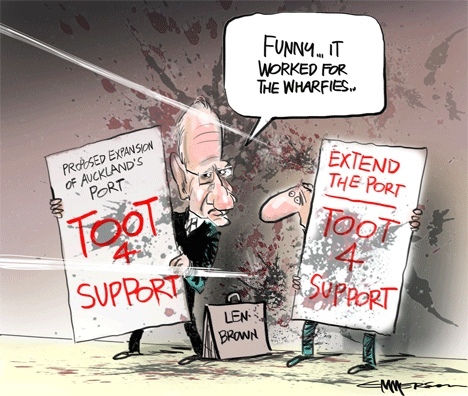 The Port Expansion Plans need to be in the spatial plan – or not – after due process. Not put in the ‘too hard’ basket and left for some future Council to deal with by applying for a resource consent. 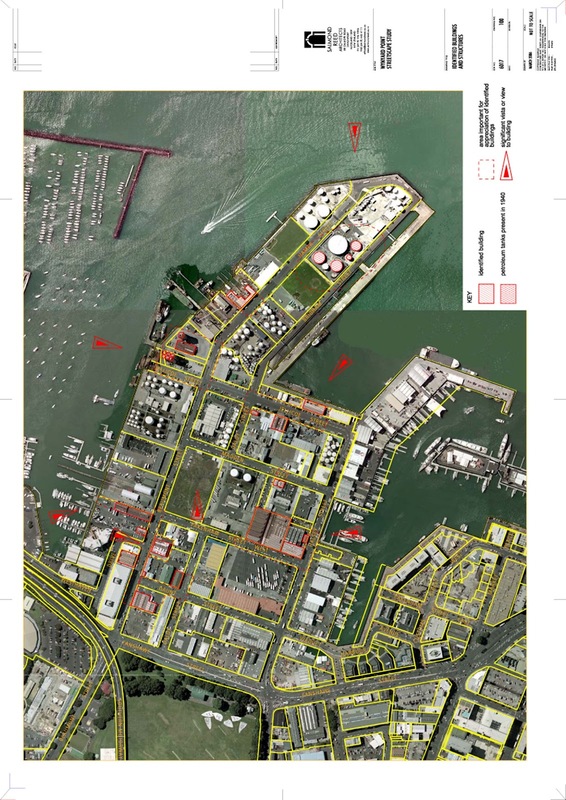 The Resource Management Act does have its place in Auckland waterfront planning. Many praise the planning work that delivered what the public love and now enjoy down at the Wynyard Quarter. Auckland City Council and Auckland Regional Council sweated blood over plan changes and resource consent applications and public hearings hammering out the planning framework for what we see today. That was due process, once fundamental and broad brush decisions had been taken about how the land and water spaces would be used. It respected matters such as heritage and the public interest in, and enjoyment of Auckland’s waterfront. Unlike the way Auckland Council is handling waterfront development right now. Under Mayor Brown’s leadership, Auckland Council is planning a major change in the use of Queens Wharf (Auckland’s Primary Cruise Ship Terminal), which has a raft of environmental effects (traffic on Quay Street, passengers in buses and taxis, conflicts with public access and ferry traffic, engineering work on a heritage building), apparently without going through due process. Last week I was advised that no decision had been made to publicly notify any consents for the development of Queens Wharf. No responsible Council would allow a private developer to do what Auckland Council and its ‘council-controlled organisations’ plan to do with Queens Wharf. Not without a decent set of resource consents and conditions. It’s good to talk about ‘proper process’, now it’s time to walk the talk on the waterfront. Behind the scenes there are those who say, "but the Spatial Plan has no statutory force...." almost as an excuse to defend the use of the resource consent process as the best way forward. However, as the Council officer advised the council during its meeting, any resource consent application must "have regard to any other matter the consent authority considers relevant and reasonably necessary to determine the application..."
The Auckland Spatial Plan - which is a statutory requirement - and which has been consulted extensively - might be regarded as having "no statutory force" by some - black letter of the law types. But it must be a relevant matter, otherwise why have one at all? A major requirement for the idea of a spatial plan is to enable Auckland to plan for what it wants in future. The Resource Management Act has a purpose to avoid adverse effects. We need that. But we also need a plan that sets out a future. And that plan needs to include an agreed plan for the Port. The old Port expansion plans of 1989 need to be reviewed in the light of new thinking in 2012.